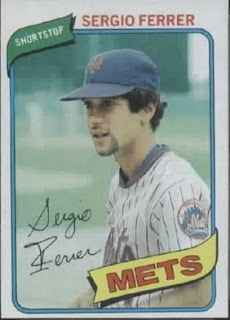 Sergio (Marrero) Ferrer was born on January 29, 1951 in Santurce, Puerto Rico. The five foot seven middle infielder was originally signed by the Los Angeles Dodgers in 1970. He was then drafted away Rule V, by the Minnesota Twins in December 1973. He debut in Minnesota at the start of the 1974 season behind regular short stop Danny Thompson. That year he hit a career best .281 in 24 games before being sent back to AAA in May. He would make the team out of Spring Training again in 1975 & play 32 more games. He hit.247 & drove in his first two career runs but was back in the minors by June. Ferrer would spend the next two seasons in the minors getting traded first to the Philadelphia Phillies & then the AL New York club. 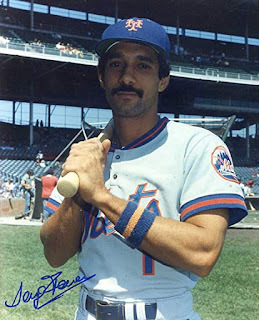 He played in their organizations before coming over to the New York Mets for Roy Staiger in December 1977. He was the first played to don the uniform #3 after Bud Harrelson had worn it since the mid sixties. 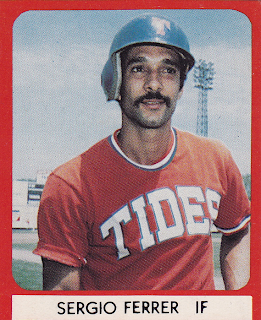 Ferrer drove in 22 runs batting .241 at AAA Tidewater when he was brought up in late April of 1978. The quick footed Ferrer, was used as a pinch runner or late inning defensive replacement in 37 games, batting just .212 in 33 at bats with one stolen base. In 1979 he began the year back at AAA Tidewater, but rejoined the Mets that June through the rest of the season. He had seven at bats going hitless with three strikeouts, seeing action in 32 games. He never got back to the major leagues after that, batting just .242 with 43 hits & three RBIs lifetime in a four year career. Ferrer played in the minors through the 1981 season, and later appeared in the short lived Senior Professional League in 1989.